This is the oldest of my computers, at least in terms of how long I’ve had it. My parents bought it new in the summer of 1985, right as I was starting high school. I didn’t…not exactly, anyway. 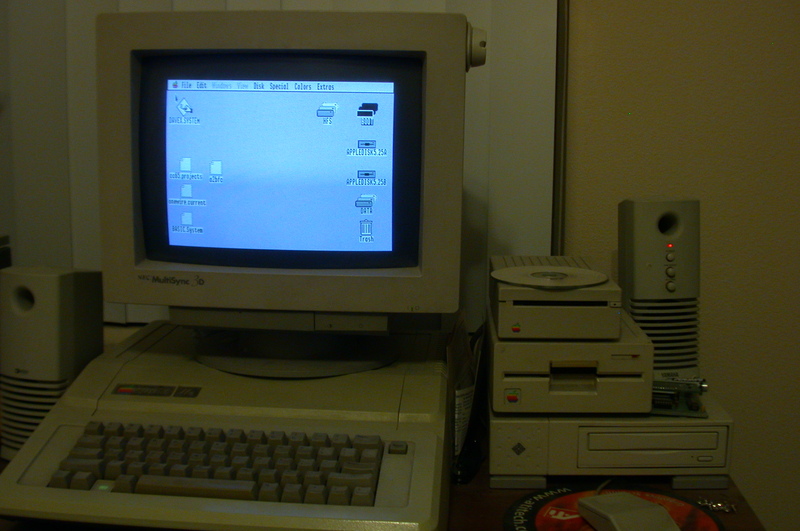 :-) It started life as a IIe with 128K RAM, two 5.25″ floppy drives, a Monitor II green-screen, and an Imagewriter connected through a Super Serial Card. Over the past 16 years, it’s been upgraded a bit at a time. 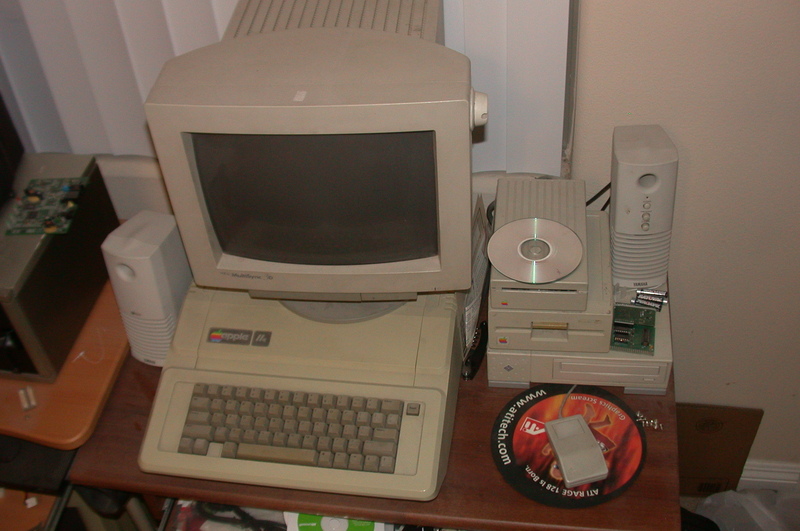 The most significant upgrade was in 1993, when it morphed into a ROM 01 IIGS with one of the upgrade kits sold by Shreve Systems. Sequential Systems RAM-GS memory card with 4MB, modified to fit in a IIe case. Apple High-Speed SCSI Card (also have a rev. C RamFAST, but I couldn’t get the CD-ROM drive working with it). ZipGS accelerator…originally 8 MHz with 16K cache, now 12.58 MHz with 64K cache (had reliability issues running it at 12.5 MHz). stock IIe power supply replaced with the innards of a 250W PS/2 (AT) power supply. 4.3GB Seagate Barracuda SCSI hard drive, in an external case (not shown) connected through an 80-to-50-pin adapter. 4x SCSI CD-ROM drive (in the Sun case under the floppy drives)…and you can boot from it! 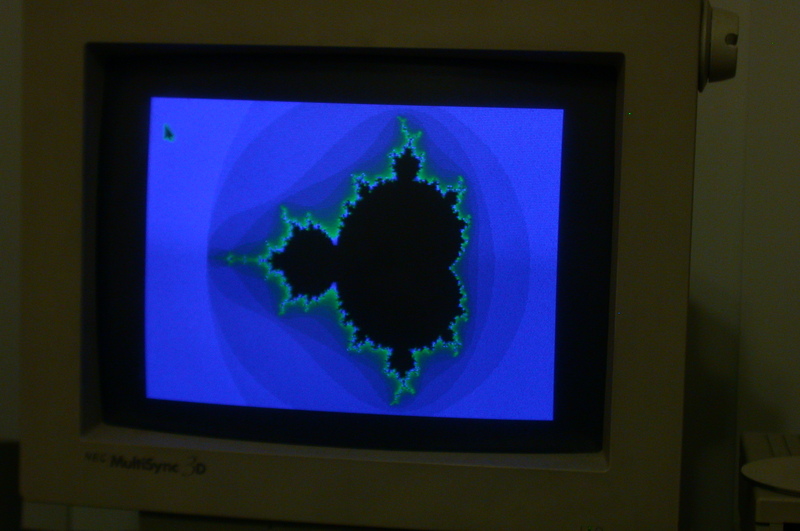 NEC MultiSync 3D VGA monitor, one of the few that will sync down to the IIGS’s 15.75-kHz (same as NTSC) horizontal sync rate. In addition to the DuoDisk, the system now has an Apple 3.5 Drive as well since most GS software shipped on 3.5″ floppies. A SupraFAXmodem V.32bis that was a “hand-me-down” from the BBS I used to run is around here somewhere, but I almost never need to use a modem anymore as the Internet has all but wiped out the dial-up BBS. It’s connected to the home network through a Cayman GatorBox CS, a LocalTalk-to-Ethernet bridge. 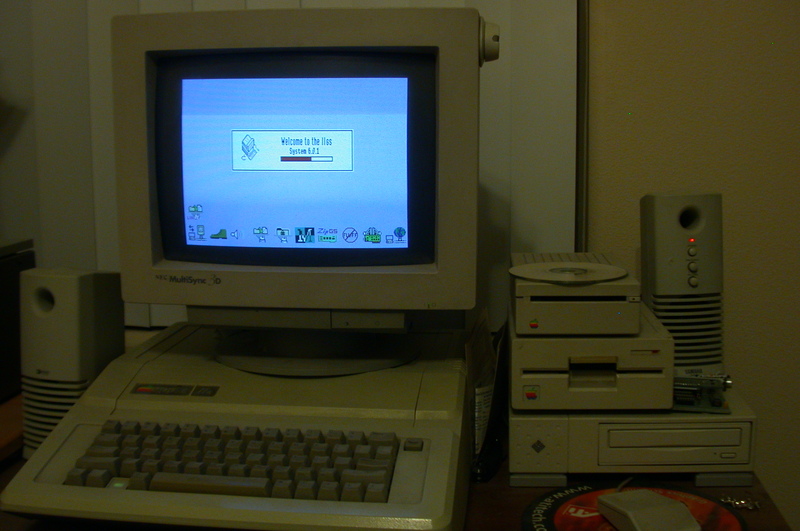 It’ll talk to a Linux box running Netatalk, or some of my older Macs (though not the Mac mini…Mac OS X dropped support for the flavor of AFP spoken by the IIGS at some point). 2.8-MHz 65C816 16-bit microprocessor, 100% backward-compatible with the 65C02. 256K RAM, expandable to 8MB. Seven standard Apple II expansion slots, plus a dedicated memory- expansion slot. Integrated graphics that support all modes supported by the IIe, plus Super Hi-Res. This mode allows 200 lines of either 320 or 640 pixels each. Sixteen palettes are available; any scanline can use any palette and can display either 320 or 640 pixels. 640-pixel lines can use four colors from the palette, while 320-pixel lines can use all sixteen palette colors (palette colors are selected from 4096 possible colors–four bits each of red, green, and blue). Unlike other Apple II modes, which use a weird addressing scheme selected to use one less chip in the original Apple II, Super Hi-Res uses linear addressing like any other framebuffer. Output is to both composite video (like other Apple IIs) and analog RGB at NTSC scan frequencies (like the Amiga). Integrated Ensoniq 5503 wavetable synthesizer, with its own 64K of sample RAM…a feature that was way ahead of its time, considering that most PCs didn’t offer wavetable synthesis as a standard feature until the mid-90s. This is a 32-voice, 8-channel synthesizer. As used in the IIGS, two voices are reserved for system use and the remaining 30 are typically used in pairs to yield 15 usable voices. Also, all channels are mixed to produce mono output to the built-in speaker or the headphone jack. “Soundcards” for the IIGS are little more than demultiplexers and preamps (and sometimes power amplifiers) that prepare line-level or microphone input for the Ensoniq chip, demultiplex the audio signal into two channels for stereo sound, and produce line-level and/or amplified output to drive powered and/or unpowered speakers. Two Zilog 8530 serial ports, just like the Macintosh. In addition to offering (mostly) RS-232-compatible serial communications for printers and modems, LocalTalk networking was also possible. One Apple Desktop Bus (ADB) port for keyboards and mice, which takes most of the same keyboards and mice that a Mac can use. 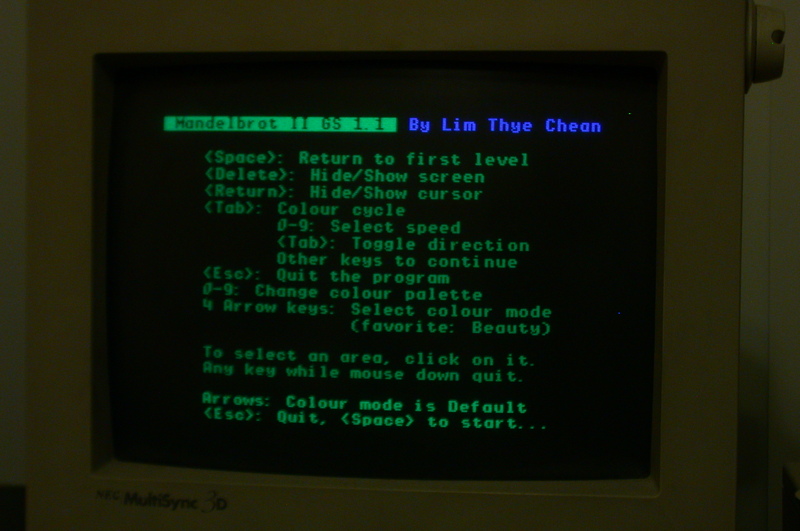 There are also headers on the motherboard for the IIe keyboard and (optional) numeric keypad, which I use instead of an ADB keyboard. Integrated SmartPort floppy controller, based on the Integrated Woz Machine (IWM) controller chip–a single-chip implementation of Steve Wozniak’s Disk II floppy controller. Integrated real-time clock with some extra memory for system settings (serial-port speeds, text colors, etc.). Apple II History, everything you could want to know about the II and the people behind it. Marinetti, a TCP/IP stack for the IIGS that supports SL/IP and PPP connections over the serial ports. SHH Systeme, manufacturer of IDE controllers and Ethernet adapters for the II. ReactiveMicro sells new hardware and parts for vintage hardware.